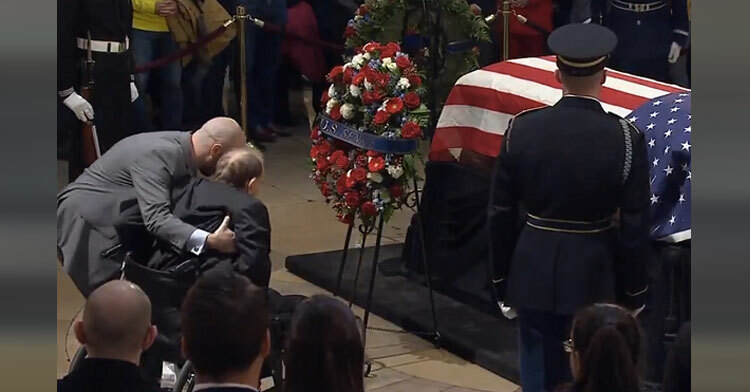 George H. W. Bush’s Former Rival Struggles Out Of Wheelchair For Beautiful Gesture. 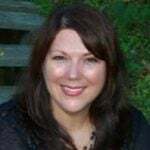 In death, all grievances can be put to rest along with the corporal form. In 1996, Bob Dole was the Senate majority leader and Republican nominee for president of the United States of America. 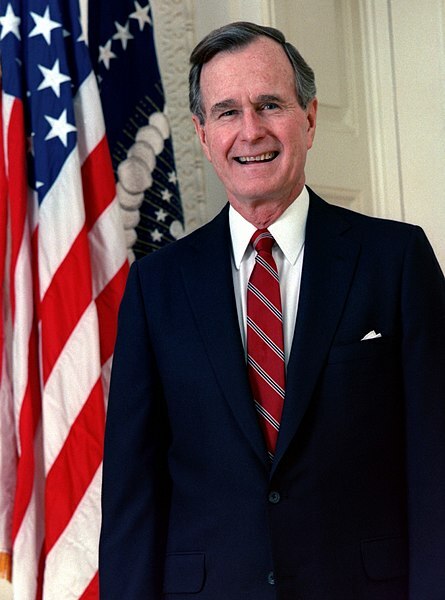 Twice he campaigned against George H. W. Bush for the presidential nomination, and at one time they were described as bitter political adversaries with a “deep personal animosity.” Later in life, the two put their differences aside and became friends. 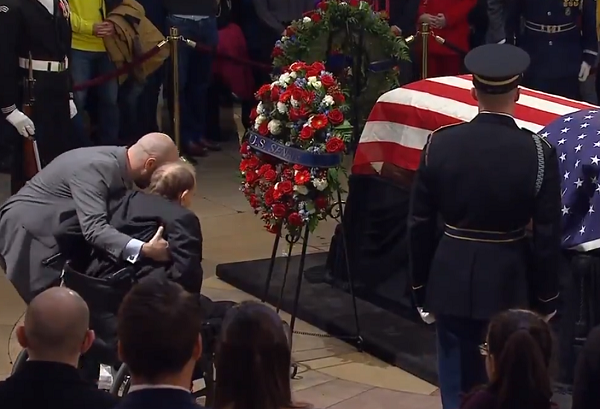 In spite of their former rivalry and numerous differences of opinion, Dole arrived at the Capitol Rotunda where former president Bush lay in state prior to his burial on December 5th 2018. At age 95, Dole is frail and in poor health, but he didn’t let that stop him from paying his respect to a fellow World War II veteran in the only way he knew how. In a video captured by C-SPAN, Dole can be seen struggling to his feet with help from an aid. As his helper steadied him on his feet, Dole raised his left arm and saluted the flag-draped casket of his fallen friend and comrade. The longtime senator and congressman from Kansas was then helped back into his wheelchair. He then sat for several moments in somber silence to show his ultimate respect. Bush and Dole both fought in World War II, with Dole suffering extensive injuries to both arms that left his right arm nearly useless and his left hand numb. Yet in spite of his physical challenges, Dole managed a salute that left everyone breathless in its simple, dignified message of hope. In addition to honoring Bush at his funeral, The Dole Institute of Politics at the University of Kansas has also set up a special memorial to honor Bush’s legacy and his connection with Dole. 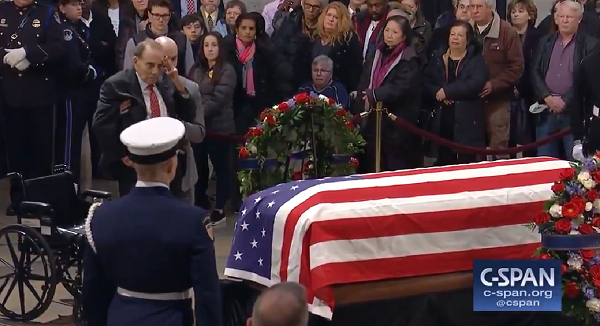 Bush will be honored with a funeral service at the Washington National Cathedral Wednesday before his body is flown back to Texas to be buried next to his late wife, Barbara Bush. Rest in peace, sir. 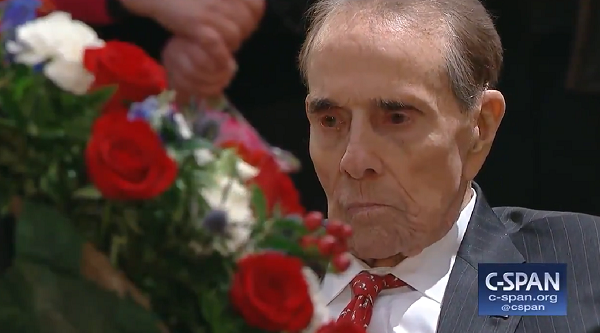 Watch Bob Dole’s beautiful moment of respect in the video below, and be sure to share.